Progreso head football coach Frank Martinez gives direction on the practice field at Progreso High School on Wednesday, Aug. 29, 2018, in Progreso. Thousands will crowd popular stadiums such as Bennie La Prade in Donna and Richard R. Flores Stadium in Edinburg tonight and Friday night for the start of the Texas high school football season. Progreso’s not-so-massive stadium will attract a couple hundred fans when the Red Ants play host to the La Villa Cardinals on Friday. It is a battle between the two teams with the smallest enrollment numbers in Hidalgo County. With that status comes unique challenges, such as lower participation numbers and maintaining tradition. 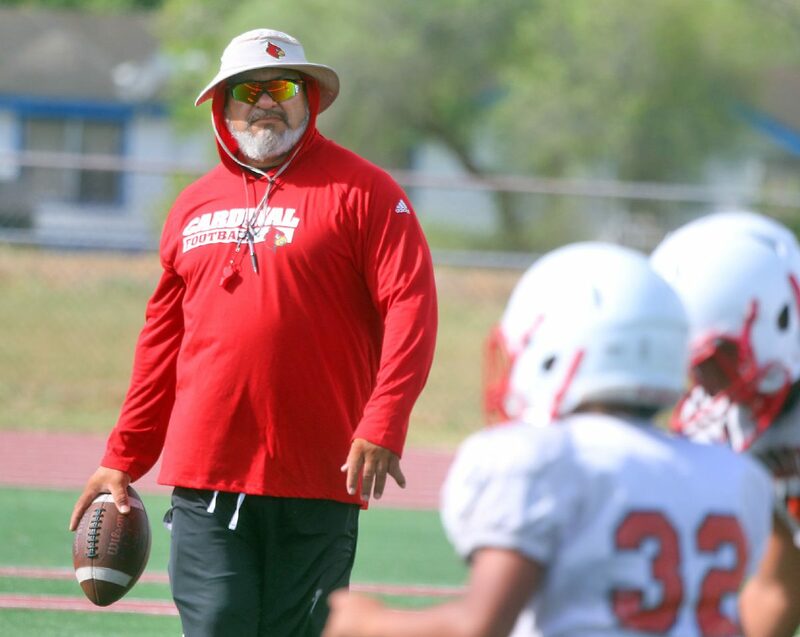 The head coaches for both teams — Frank Martinez (Progreso) and Danny Perez (La Villa) — understand what it’s like to play under the Friday night lights for a team known for its tradition and passionate fans. They competed for Edcouch-Elsa, where boys grow up wanting to be a Yellow Jackets football player. The program also has a menacing nickname, La Maquina Amarilla . “It was a little culture shock when I came here,” Martinez said about taking over at Progreso in 2017. “Obviously, it is a little different. There is hardly any tradition out here. I will say one thing for myself, I love coaching and, once you do it, you’ll do it anywhere. I love helping kids and I love where I am right now. La Villa head football coach Danny Perez gives direction on the practice field at La Villa High School on Wednesday, Aug. 29, 2018, in La Villa. Last season, the Red Ants finished 1-8 and are in the midst of the longest playoff drought among Hidalgo County teams. However, this year Progreso is a shoo-in for the postseason because it is a member of District 16-4A, Division II, a four-team league. And four teams from each district make the playoffs. Martinez, though, doesn’t want his Red Ants to have a lucky-to-be-here attitude. “Last year was the beginning of a lot of things for the program,” Martinez said. “We held our first football camp, we did a midnight madness and we also created a sponsor poster for the team so that they could feel more valued. Unlike Progreso, La Villa has had spurts of success throughout its history. It is the small neighbor to the twin cities of Edcouch and Elsa. Some of the passion for high school football has rubbed off on La Villa. Perez said the Cardinals, who made the playoffs last season, sold out two games in 2017. Something he said had never happened at La Villa. Not only do they not consistently get thousands to attend their games, Progreso and La Villa struggle with participation numbers. Martinez said when he arrived in Progreso there were only 17 players in the program. As of this week, there are 55-plus players, according to the coach. At Edcouch-Elsa, they don’t need to worry about the numbers. When Perez was an assistant at Edcouch-Elsa, he said he was used to having a first, second and third team. At La Villa, you are expected to play both offense and defense. The Cardinals have only 42 players and, as of now, don’t field a freshman or a junior varsity team, Perez said. La Villa competes in District 16-2A, Division II, one level above six-man football. 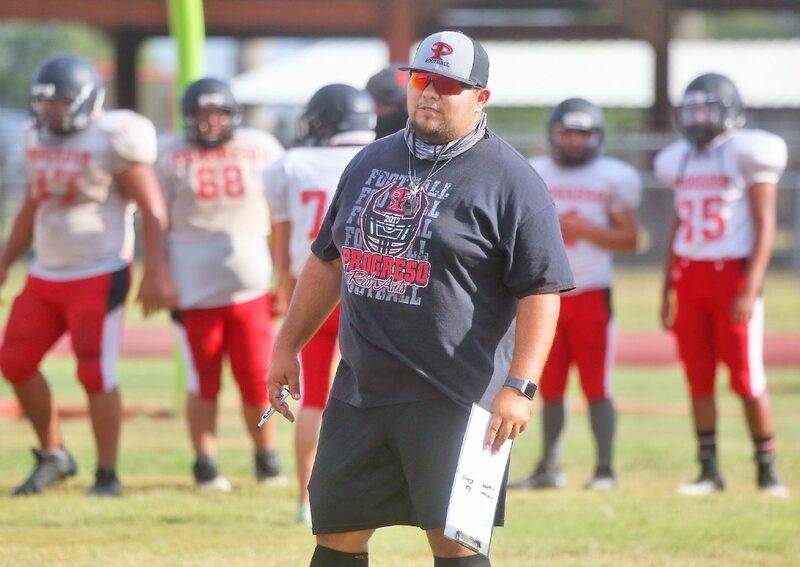 As a Class 2A coach, Perez needs to be more mindful with the amount of time his team spends preparing for games, which means shorter practice times and less rigorous conditioning in order to avoid injury. “You don’t want to lose to anybody,” Perez said. The coaches also don’t want to lose to each other on Friday and are hoping the competiveness they picked up at Edcouch-Elsa will inspire their teams. Perez played for the Yellow Jackets in the 1980s and was a member of the coaching staff when Martinez was on the roster. They were also both Yellow Jackets assistants at the same time.